In 1851 Richard Smith Clark hired architect John B. Snook to design a commercial building to replace the vintage house at the northwest corner of Broadway and White Street. Designed in the Italianate style, the five-story structure included a cast iron storefront. The openings at the second floor were dignified by triangular, Renaissance-inspired pediments. Those above wore molded cornices and sat on stills upheld by dainty brackets. A cast cornice with paired foliate brackets completed the design. David Rait had been partners with Samuel Y. D. Arrowsmith until August 7, 1850 when the jewelers parted ways. Rait moved into the newly-completed 381 Broadway where he imported and manufactured high-end jewelry for the wholesale trade. In 1853 he advertised "diamonds in original packages, or lots therefrom to suit customers." He charged $28 (nearly $900 today) per carat. By the time Rait placed his advertisement, Broadway was seeing a far different business finding its way to Broadway. Leading the relatively-new commercial photography industry were Mathew B. Brady, Jeremiah Gurney and Martin M. Lawrence. On March 15, 1853 Lawrence established his studios in No. 381 Broadway. Lawrence was especially noted for his extra large "mammoth" daguerreotypes (they were a wall-sized 12 x 15 inches); and for his posed allegories. One, titled "Past, Present, and Future," had earned him a prize in the Crystal Palace exhibition in London two years earlier. W. Lawrence has the pleasure to inform his friends and the public that he will open to-day at No. 381 Broadway, the corner of White-street, one of the most extensive and splendid Daguerrian Galleries in the world. 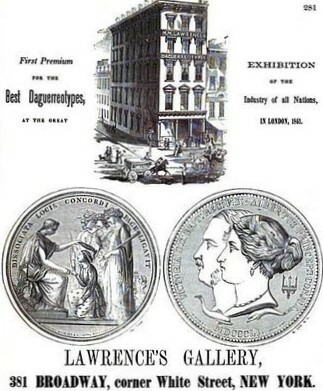 Citizens and strangers are respectfully invited to visit the rooms and view his numerous collection of 'human face divine,' and especially the frame of 25 pictures exhibited at the World's Fair, in London, pronounced the best in the exhibition, and awarded Mr. L. the first premium, the prize medal. Three months later Humphrey's Journal of the Daguerreotype described the layout, noting "a reception room on the third floor, richly furnished; two 25-by-30-foot operating rooms on the fifth floor, with 16-foot ceilings and skylights each 12 by 15 feet." Martin M. Lawrence died in 1859. At about the same time David Rait moved his operation to No. 405 Broadway. No. 381 Broadway became home to the men's furnishings store of Ira Perego & Sons, which had another shop on Nassau Street. On May 1, 1860 The New York Times noted that the store was having a "Great Sale of Neck-Ties," at "only 50 cents each." Ira Perego & Sons offered a full line of men's clothing, from underwear to outerwear. During the winter it advertised "superior shirts and collars, mufflers and shawls, fine cravats and scarfs, robes de chambre, lined kid gloves, and fancy suspenders." 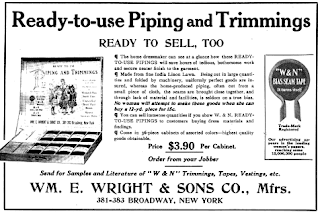 And as the hot weather approached an advertisement in the New-York Tribune noted "We invite attention to our large assortment of summer under garments, comprising--gauze silk shirts and drawers, gauze merino shirts and drawers, lisle thread shirts and drawers, &c."
By 1864 Ira Perego & Sons had moved to No. 175 Broadway and the main tenant at No. 381 was Spencer D. Schuyler. The dry goods firm operated its retail operation from the ground floor store and its immense wholesale business on the upper floors. According to The New York Times in 1864 S. D. Schuyler had made sales amounting to $253,000 the previous year; about $4 million today. Anamus M. Ronk worked as a salesman for Schuyler in 1866. On June 29th that year a young woman and her male companion entered the store. She asked Ronk to show her some silk dress goods. While she mulled over the fabrics her friend wandered casually about the shop. Finally Maria Stewart (described by The Times later as "about 21 years of age, and of genteel appearance") made her choices, asked that Ronk packed the bundles which they would return to pick them up and pay for later in the day. The Times reported "After they had left the premises the clerks missed...two pieces of silk, and as the pretended purchasers failed to return for the silks selected, suspicion attached to them." The stolen silk was valued at $260 (just under $4,000 today) and Maria was nabbed by police a few days later. Anamus Ronk identified her as "the pretended customer" and authorities announced that it was the second time she would appear before a judge on similar charges. Considering Spencer D. Schuyler's apparent success, his customers were no doubt shocked to read in the daily newspapers in June 1868 that he had declared bankruptcy. On November 11, 1882 The Record and Guide reported that Richard S. Clark "proposes to tear down the old brick building, No. 383 Broadway, and erect an office building to be joined to his other building on the northwest corner of Broadway and White street." The journal added "It will be fitted with an elevator and other conveniences." Clark would not live to see his proposal carried out. It was more than three years later when, on February 13, 1886, The Record and Guide reported "A fine store will be erected at No. 383 Broadway, which is now being torn down." The Richard Smith Clark estate had commissioned the architectural firm of J. & D. Jardine to design the building. Theowners gave the brothers, David and John, surprising instructions--the new structure should match exactly the design of the nearly 40-year old building on the corner. The result was seamless, visually doubling the size of the original structure. The upper floors of No. 383 were intended as offices. Interestingly, even as the old structure was being demolished, the Clarks announced "The building is already all rented, with the exception of the store." By the time construction was completed later that year the store had been taken. On October 2, 1886 The New York Times reported "Eugene P. Peyser, who already has a store at No. 123 Fulton-street, will open to-day a branch at No. 383 Broadway, in the very heart of the dry goods district." Like Ira Perego & Sons, Eugene P. Peyser offered a full line of men's furnishings. The journalist for The Times was impressed by the opening day prices. And like Ira Perego & Sons, the store's stock changed with the seasons. The following summer gentlemen could find "white vests and Summer coats and vests" and "drap d'ete, silk Pongee serges, white flannel and tennis coats." The Times (no doubt having received a monetary prompting from the store) opined "One cannot fail to find just what he wants among the quantities of men's outfitting, and must indeed be hard to please if the quality and texture of the Summer goods do not satisfy." Peyster's experiment with the new Broadway branch was so successful that in October 1887 he expanded into the basement level, calling it the Casino. This level was dedicated for the most part to selling coats. A newspaper wrote "the walls are tastefully decorated, the ceiling likewise, and an electric light makes the place as bright and cozy as a private parlor. This is the 'Casino,' Mr. Peyser's pride. In it the overcoat holds sway." Gentlemen shoppers could browse among "serviceable silk-faced" fall coats, and winter overcoats of "the best beaver." The most expensive of the beaver coats was $31, over $800 in today's dollars. Those overcoats would be sorely needed later that winter. On March 11, 1888 one of the worst blizzards in American history hit the Northwest. More than 400 people perished--200 of them in New York City--and as much as 55 inches of snow piled into the streets. S. M. Jackson Jacobs was 28 years old at the time, working as a clerk for Eugene Peyster. When customers were able to dig out of their homes, they headed to the store. Decades later Jacobs recalled the run on gloves and ear muffs. "We created woolen pull-over caps for our customers by slitting bathing trunks and tying a piece of string at the top of each leg. We had about ten dozen of these trunks and as caps we sold them out immediately." In the spring of 1889 the city prepared for the three-day celebration of the 100th anniversary of George Washington's inauguration. President Harrison and other Washington dignitaries would participate, a military parade, grand receptions and events throughout the city were planned. On April 24, 1889 The Times reported "New-York has begun to put on her fine clothing for the festivities of next week. Broadway is already afloat with rainbow-hued bunting and bright with the anticipations of the centennial." Eugene P. Peyster was not to be outdone. "Flags were as thick as mosquitoes and quite as lively in yesterday's breeze at Eugene Peyster's store, at 383 Broadway, for they were projecting from every window sill," said the article. Thorn had come to New York from his native Stuttgart in 1876. By now he was well known throughout the industry as a jobber of American-made school goods. One of the companies he represented was The American Crayon Co., makers of what we would today know as blackboard chalk. He was quoted in Geyer's Stationery in September 1904 as saying the "crayons" were "faultless and have no equal." He promoted the item in glowing terms. "For general satisfaction, economy and sanitary reasons these crayons should be used in every school room." As he did every spring, Thorn traveled to Pittsburgh on a buying trip in April 1907. While there he complained of indigestion, and died a few hours later in his hotel. Geyer's Stationery called him "a general favorite with the trade" and Walden's Stationer and Printer said "His friends were legion." A. G. Hyde & Sons had moved into the building in 1893. A wholesale cotton goods operation, marketed its Heatherbloom taffeta as being "Better Than Silk" in 1905. Following A. G. Hyde's death, his sons Seymour J. and A. Fillmore continued the business. Eventually, A. Fillmore Hyde left to pursue the real estate business, leaving his brother to run what The Sun would later call "a power in the trade." By 1907 the tenant list included firms involved in other than the dry goods businesses. The Tablet & Ticket Co. was here that year, makers of memorial plaques and, most importantly, the Willson Building Directories. Architects and building owners embraced the new concept that allowed visitors to easily find the location of an office within the building. As tenants came and went, their names could easily be added and removed. On December 13, 1913 The Record and Guide touted the "bulletin boards with letters to apply which can be locked in." As modern skyscrapers rose, The Tablet & Ticket Co. provided the lobby directories. In April 1907 it received contracts for the new United States Realty Building and the Trust Co. of America building on Wall Street. The following year the firm received the contract to install directories in the 47-story Singer Building. The Table & Ticket Co. would do business from here into the 1920s. Other long-term tenants were the W. S. Howell Ticket Agency, in the building from about 1903 through about 1912; and the Wm. 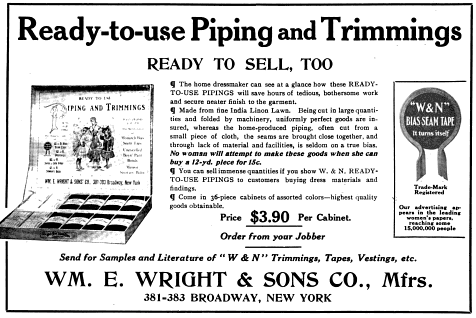 E. Wright & Sons "piping and trimmings" firm, in the building from about 1909 into the 1920s. In 1913 A. G. Hyde & Sons suffered its first misfortune in the death of Seymour Hyde. A. Fillmore returned as president, Seymour Worrall Hyde, the son of Seymour J., took the position of vice-president. When the United States entered World War I Seymour enlisted in the 306th Infantry. But things went terribly wrong. By the winter of 1918 Hyde was a First Lieutenant. On leave in the city he ran into a sergeant on the street who failed to salute him. After mildly rebuking the lower-ranking officer, Hyde ordered him into a taxi cab. The New-York Tribune reported on February 2 1918 that it stopped at No. 381 Broadway, "which houses the New York counting and stock rooms of the great woollen firm of A. G. Hyde & Sons." In a bizarre turn of events Hyde held the sergeant captive in an upstairs office and called for two privates from nearby Camp Upton to stand guard. He told them he was questioning a German spy. The sergeant was subjected to interrogation from 10 in the morning until 6 that night. The sergeant later testified "Part of the time Hyde made me dictate answers to his questions into an office phonograph. He had me strip off my shirt, and every once in a while he'd listen to my heart. "'It's beeint too fast,' he would say. 'You're lying to me.'" At one point he took the two privates outside "and wrapped them up in lavender cloth from head to foot, so that all I could see of them was there eyes. I almost had the willies, but they were perfectly solemn about it." When authorities finally were alerted to Hyde's strange behavior, he was diagnosed with a nervous breakdown and committed for treatment. Later that year, on December 24, The Sun reported "The revolver shot at Sarajevo that woke up the world four years ago was the crack of doom for the house of Hyde...Its export and import trade, upon which its success was largely built, was choked off by the war. The inevitable happened yesterday, when A. Fillmore Hyde...summoned all its employees, many of whom have grown old with the firm, before him and told them the business would be closed out." Oddly enough, while the garment industry moved north of 34th Street by mid-century, the Broadway building continued to house textile firms, like Murray Textile Co., Inc. here in the 1970s. Even as the 20th century waned textile companies, hold overs from the time a century earlier when this neighborhood was the dry goods district, still occupied the upper floors. In 1992 the ground floor shops housed a restaurant and newsstand. Today most of the architectural elements have been stripped from the facade of No. 381. The trendy change in the neighborhood is reflected in the two ground floor shops--a pizza restaurant and a shoe store. And the fact that the two halves were constructed 35 years apart is, for the most part, unknown among New Yorkers. The Lost Clement C. Moore "Chelsea House"